Horn of Africa, made up of Somalia, Djibouti, Eritrea, and Ethiopia. Elephant in the Serengeti, May 2006. 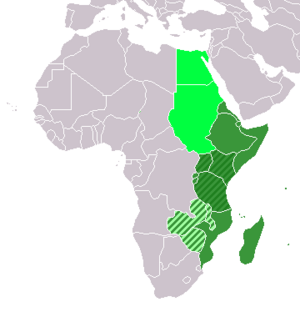 Eastern Africa consists of two distinct geographic regions: the eastern portion of the African continent that includes Kenya, Tanzania, and Uganda and the Horn of Africa, which includes Somalia, Djibouti, Eritrea, and Ethiopia. Other nations are often considered a part of the eastern Africa region, though distinctions seem to vary by organization. The Horn of Africa contains a wide diversity of geographical features, ranging from the Ethiopian highlands to the Ogaden desert in southeastern Ethiopia. The Horn of Africa is a peninsula jutting out from the African mainland and bordered by the Red Sea, the Gulf of Aden, and the Indian Ocean. The geography of the eastern portion of the African mainland exhibits the same variety of natural features found in the Horn of Africa. East Africa is a land of drastic geographic contrasts, featuring the two tallest peaks on the continent, Kilimanjaro and Mount Kenya, and the Great Rift Valley, a deep gorge shaped by tectonic forces. East Africa is also famous for its bodies of water and boasts both Lake Victoria, the world's second largest freshwater lake, and Lake Tanganyika the world's second deepest lake. Throughout the region, farming flourished on the nutrient–rich land. Some scholars argue that the fertile lands of Eastern Africa were a major contributor to European colonialism, as many European powers desired to utilize the agricultural resources. Beyond agriculture, fertile lands also provide a home for a wide variety of wild animals. Some parts of Eastern Africa have garnered worldwide fame for their heavy concentrations of what is often termed the "big five": the elephant, water buffalo, lion, leopard, and rhinoceros. The Serengeti Plain of Tanzania supports large migratory herds of zebra, wildebeest, antelope, and gazelle as well as the lions, cheetahs, and wild dogs that prey on them. 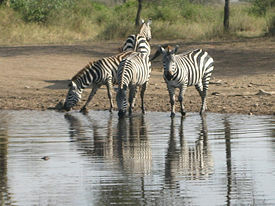 Despite declining wildlife populations, Eastern Africa continues to attract tourists looking for contact with big game. Due to the wildlife population, and the dramatic landscape of the area, tourism has become a major component of the Kenyan, Tanzanian, and Ugandan economies. Eastern Africa, due to its coastal location, was heavily involved in trade and developed an export economy early in its history. Early trade in the region is documented by a team of archaeologists who have found Egyptian coins in the port city of Mtambe Mkuu in modern day Tanzania. These coins document East African exportation of furs, gold, ivory, and rock crystals as early as 1000 C.E. In the nineteenth–century Scramble for Africa, Eastern Africa became a prime target for European nations looking to expand into the fertile agricultural lands where trading ports were already well established. The only country to escape the demands of European colonialism was Ethiopia, which successfully repelled invasion attempts by Italy. Ethiopia enters the annals of history as the oldest independent nation in Africa. The first European power to establish a presence in Eastern Africa was Portugal, who set about acquiring a position in southern Mozambique. Using southern Mozambique as a base, the Portuguese expanded their sphere of influence northward, eventually reaching modern day Kenya. Portuguese attempts at expansion stopped only when it reached the British Protectorate of Nyasaland (modern day Malawi). Portuguese forces surrounded the British stronghold and solidified Portuguese control of the entire eastern shore of the lake, a move that prohibited further British expansion in the area. Despite Portuguese attempts to hinder British expansion, Great Britain succeeded in cystralizing its position as a major colonial force in east Africa. British interests in the area primarily focused on acquiring fertile agricultural land, and with this goal it was quick to acquire Uganda and Kenya. Both of these lands boasted extensive wildlife and a long history of cash crop agriculture for exportation. The nutrient rich lands of Eastern Africa were ideal for large scale agriculture, especially valuable crops such as coffee and tea. Along with agriculture, the British raised large herds of cattle and goats to raise money for the crown, selling both the meat and animal by-products like milk. Due to economic opportunity in the region, the British began to establish residential areas like Nairobi and Entebbe that mirrored residential life in Great Britain. Eastern Africa also received many British nationals who were relocated to the region. The British and Portuguese were joined in the region by the French, who settled in Madagascar. In an odd twist of history, French colonialism in Eastern Africa was aided by the British, as they had ceded Madagascar to France in exchange for control of another island nation in Zanzibar. Smaller islands near Madagascar, especially Réunion and the Comoros also fell under the control of the French. Germany and Italy also gained strongholds in Eastern Africa, although of less strategic importance than the areas controlled by the Portuguese and the British. Germany exercised control over a larger area than Italy, with German East Africa comprised of present-day Rwanda, Burundi and the mainland section of Tanzania named Tanganyika. Tanganyika did not remain under German control for long, however, and was transferred to Great Britain under a League of Nations mandate in 1922. It continued under British rule until it gained its independence in 1961. In 1965, the Zanzibar Revolution united the independent state of Tanganyika to mainland Tanzania and formed the United Republic of Tanzania. German interests in the region never proved very politically important, mainly due to the fact that areas occupied by the German had very harsh climatic conditions and settlers often fell to native diseases. Like German territory in Eastern Africa, Italian territory never proved large enough to cause trouble on the international scene. Italy controlled only the southern three-fourths of Somalia, while the British controlled the northern portion. Hemmed in by superior forces, Italy was unable to establish a formidable presence in the area. Contrary to the theme of political instability in the region, Kenya has enjoyed relatively stable governments. The peace has been punctuated at times by instances of violence, including the attempted coup d’état in 1982, but these are short lived and the country is overall stable. Burundi and Rwanda suffered civil wars and acts of genocide during the twentieth century, while Somalia and Ethiopia are punctuated by military conflict. The two main regions of Eastern Africa, the Horn of Africa and East Africa both have a long history with Arabia and the Middle Eastern lands. Major populations in the Horn of Africa include the Amhara, Tigray, Oromo, and Somali peoples. They are linked together due to deep linguistic and cultural ties, the main tie being the common use of Afro-Asiatic languages existant in North Africa and the Middle East. Throughout history, the Horn of Africa has been in contact with the Arabian peninsula and Southeast Asia, and both Islam and Christianity are deeply rooted in the cultures of the region. East Africa also had contacts with the Arabian peninsula early in its history, especially through the island of Zanzibar. While these early contacts contributed to the culture of East Africa, the heaviest cultural influences in the region come from the Bantu Kingdoms near Lake Victoria and the Kenyan cattle raising civilizations in the highlands. The East Africa nations show a much closer affinity with sub-Saharan Africa than with their Middle Eastern neighbors. African scholars have attempted to classify the peoples of Eastern Africa. The population is fragmented into many subdivisions based upon lineage—patrilineal in some areas, matrilineal in others—language, religion, subsistence and habitat among others. Despite such fragmentation and differences, the various groups tend to share much of their culture in common. Natural resources of the area have a big impact on the economies and livelihood of the people of the region. The majority of the population is dependent mainly upon pastoralism or agriculture for survival, with agricultural products the main, though limited, exports. Rainfall is a determining factor in the productivity of agricultural endeavors and varies throughout the region. In many areas it is inadequate for crop cultivation, and pastoralism is relied upon. The result is a nomadic way of life for many, which has a negative effect on schooling and medical care. 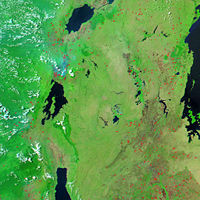 Lake Victoria and the lakes of the Rift valleys support fishing communities who export to distant markets. However, management of this resource has not only proven difficult but caused international conflict where these bodies of water are bordered by more than one nation. Ethnic and religious rivalries exist due to the variety of peoples and tribes, Muslim, Christian, and Cushitic in origin, with differing lineal descendancies. Eastern Africa. Encyclopedia Britannica. Retrieved July 25, 2007. This page was last modified on 26 September 2017, at 15:10.